Irshad’s new house. The neighbourhood is so dense that it is impossible to take a photo of the entire house. But you can view more photos of the construction and finished house here. Irshad’s feedback after the construction of his house. Irshad bhai works as an accountant at a Foundation in South Mumbai. He requested design support from urbz. This was for his new home in Dr. Ambedkar Nagar, a dense, incremental settlement in Kanjurmarg, in the northeastern suburbs of Mumbai. He lives with his parents, wife, sister, brother, and two-year-old daughter. The family wanted a new house to accommodate their growing needs that could be built with their savings. They have been living in a ground floor house in Dr. Ambedkar Nagar, and have just moved into the new G+1 house we helped them build. In such dense ‘homegrown’, relatively affordable neighborhoods, it is very difficult to simply execute a pre-fabricated and specific design/plan. The process of execution has to be necessarily fast and quick. It becomes affordable only because labour and industrial materials are easily available locally. But the complexity of the context means that one needs to constantly adapt the design to changing circumstances. In such a scenario the best approach is to evolve the design on the spot as the construction unfolds. This is what we call ‘unmediated design’ or ‘live architecture’. 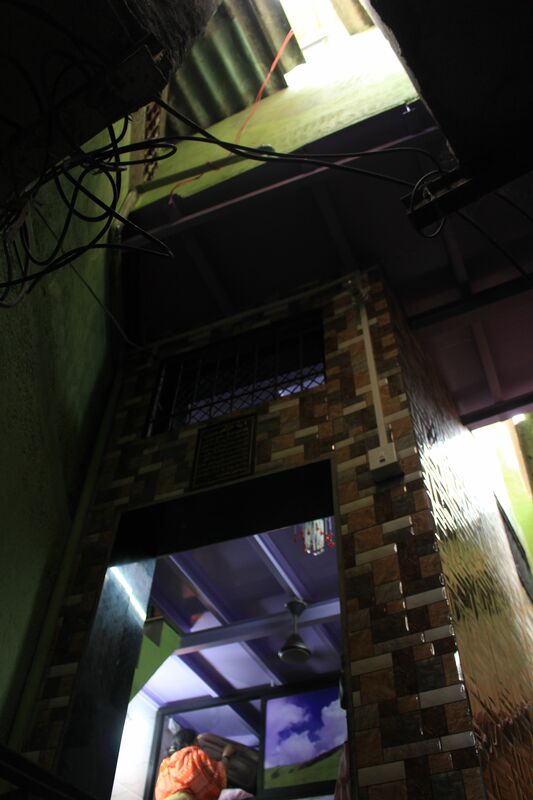 A major concern while designing the house was to provide enough light and ventilation in a very crowded setup. 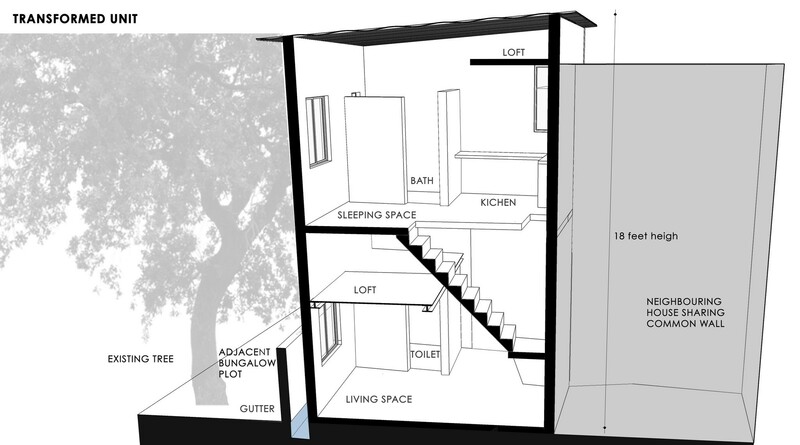 This involves thinking about the optimal size for each part of the house, and an efficient placement of openings on external walls. Due to space constraints, it is also particularly important to think through the spatial organisation of the various functions of the house. Initially the family was trying to arrange a living space, a kitchen, two small baths, and two extra rooms to let out for rent, over two storeys. 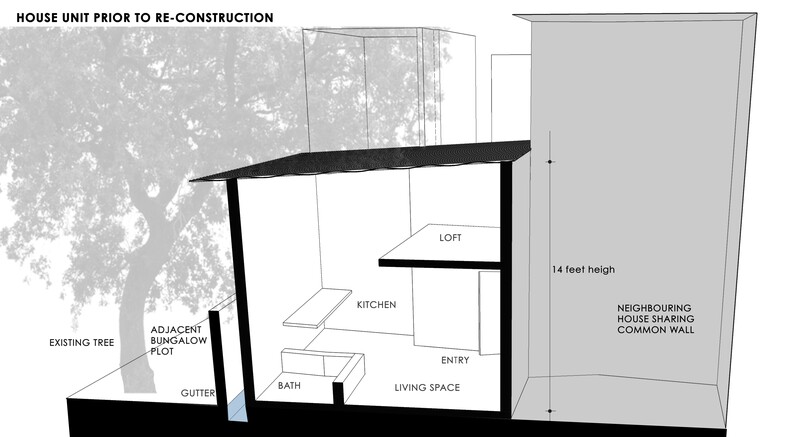 That is a rather heavy program to put in place on a 143 sq.ft plot. Eventually, the family decided to use the entire two storey space, which made things a little simpler from a design point of view as the house didn’t need two separate entries on the upper floor.. The lower level is now a common family space and has a toilet. The kitchen, which was initially supposed to be downstairs for the family, has now been moved upstairs. This happened because the family wanted to use the entire house, with a bigger common space downstairs. The upper floor has a bath and sleeping area. One of the biggest challenges in the new construction was the resident of a bungalow whose compound wall is just next to the rear side of Irshad bhai’s new house. The woman living in the bungalow objected to the new house’s height being increased. She felt it would block the flow of wind into her house. She also argued it would be illegal, unaware that as per the new norm, houses in areas notified as slums can legally be up to 18 feet in height. The family also faced a lot of resistance from their neighbours within the compound, who were concerned that the new construction would damage their houses. Subsequently, members had to repeatedly visit the ward office to get permission. Irshaad bhai’s mother said that they had to go through a lot of trouble and the authorities demolished their structure twice before it was allowed to be completed. Eventually their neighbours consented to an extension into the public pathway from the upper floor. As a result the entire area became more functional. Settlements like Dr. Ambedkar Nagar in Kanjurmarg are different from and in some ways more interesting than Shivaji Nagar, where urbz built a house – which is what brought us Irshad bhai’s attention. Shivaji Nagar is a planned resettlement colony, which means that plots are equal in size and organized in neat rows. Dr. Ambedkar Nagar is ‘homegrown’ in every sense of the word. The streets follow an opportunistic pattern and houses push their wall onto pathways as much as possible. Construction was done in steel rather than RCC. This made it cheaper, less permanent, more incremental and flexible. In this particular locality, most constructions have shallow foundations of around 1.5 feet, which ensure that costs remain low and the foundations of the neighbouring houses are not disturbed. All of this makes the constructions legal as well as adaptable to specific requirements. But it also means that constructions are not quite as permanent or disaster resistant as they should be. According to Irshad bhai’s mother, when she first started living here in 1982, it was almost completely empty. With time, people started to settle here, the density increased and the feeling of insecurity which prevailed in the night disappeared. The water and infrastructure improved, and now, she says, it is a peaceful and very safe area. The history of the nagar plays a significant role in the way development happens here. Because of its spontaneous and human growth history, new constructions and designs are implemented through mutual consent and understanding with neighbours in the locality, more than with municipal authorities. 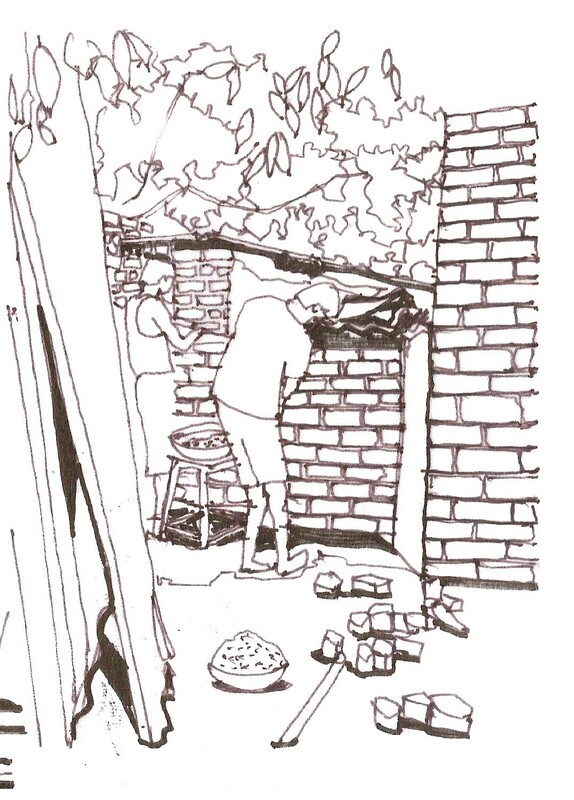 When people want to extend part of their house or make a balcony, they discuss it and negotiate with the neighbours whose wall their balcony may reach. This kind of procedure which is undocumented and often involves conflict and resolution is an essential part of the growth process. 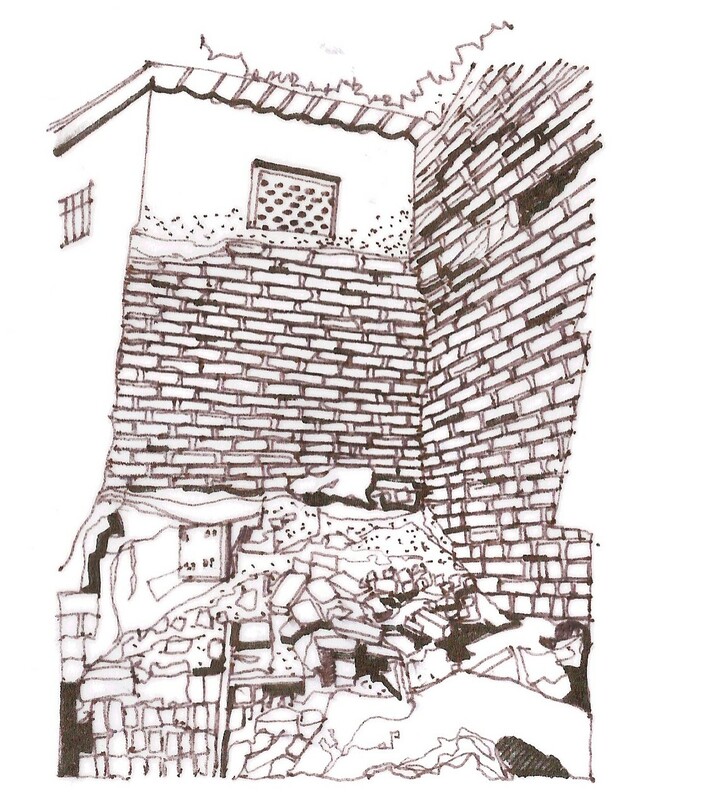 It points to both, the positive and negative aspects of the dense social fabric of neighbourhoods such as Dr. Ambedkar Nagar and many others like it. Irshad bhai’s family plans on using both floors of the new house as well as their old house to live in now. In Dr. Ambedkar Nagar, it is possible and necessary for joint families to spread themselves across houses. This use of “small and dispersed spaces further adds to the strong social fabric of the way the neighbourhood operates. Irshad bhai’s mother is glad that her family now has so much more space to grow. Residents of Dr. Ambedkar Nagar face pressure every time inhabitants want to construct something new. This is because the entire settlement had once been proposed for “redevelopment” many years ago. Though there no actual signs of redevelopment happening anytime soon, the repair or reconstruction of homes is seen as legally suspect. Given the resistance to the improvement of homes, from both institutional and local actors, every kachcha house transforming into a pukka house is a story worth telling – one which is extremely significant to the residents and their requirements, and also to the development of the city at large.